The Huffington Post has just run an article I co-authored with my colleagues Rennie Silva and VS Subrahmanian, about the the latest military aid package to Pakistan. Considering that country's vast humanitarian suffering, other aid priorities seem in order. More Military Aid to Pakistan? As part of the U.S.-Pakistan Strategic Dialogue, the United States has granted Pakistan over $2 billion in military equipment over the next five years. This aid is intended to support American policy objectives and help stabilize Pakistan, but it may be achieving the opposite. Military aid for Pakistan has a clear, if narrow, logic: to ensure the supply lines for the 100,000 American and NATO ally troops deployed to landlocked Afghanistan. The United States has few viable alternatives to the Pakistani-controlled routes into Afghanistan. When Pakistan recently shut down the Torkham crossing into Afghanistan (after an accidental border clash with a NATO helicopter that left two Pakistani soldiers dead and four wounded), supply trucks backed-up and Pakistani Taliban set fire to over 100 vehicles. Though there was no immediate danger of shortages, the event signaled how difficult US-led operations in Afghanistan could become without support from Pakistan's military. Despite its indispensable role in the war in Afghanistan, Pakistan's own stability is in doubt and military aid has been of limited utility. Since 9/11 the United States has delivered over $18 billion in aid to Pakistan, about two-thirds of which has been military. In that period, violence by Pakistan-based terrorists both within Pakistan and without has increased substantially. According to the National Counter Terror Center's World Incidents Tracking System, 110 Pakistanis were killed in terror attacks in 2004. By 2007 that number had jumped to 400, and in 2008 the casualty figure more than doubled to nearly 900. As illustrated by the recent bombing of the Criminal Investigation Building in Karachi which killed 20, American aid has not enabled Pakistan's security forces to control the violence. Instead, Pakistan has become a base for terrorism not only targeting the Pakistani state but also India, as demonstrated by the 2008 Mumbai massacre and a deadly series of 2006 commuter train bombings in Mumbai which killed over 200 people. India's response to these attacks has been muted, but its restraint is finite. Open hostilities with its neighbor to the east would be devastating for Pakistan, and could even trigger a nuclear exchange. Although several thousand Pakistani soldiers have died fighting Islamist extremists, the Pakistani security establishment has been slow to adopt counter-insurgency methods of war fighting. Instead, it has preferred to continue its India-centric focus. Investigations of U.S. military aid intended to help Pakistan fight the Taliban find that it is often re-purposed to counter India. "I'll be the first to admit, I'm India-centric" Pakistani army chief of staff Gen. Ashfaq Parvez Kayani told Bob Woodward in his latest book, revealing a long-term strategy that is at odds with US interests. Pakistan's ongoing use of Islamist terrorists as proxies against India is especially troubling. President Zardari, who has stated "the undeclared policy of running with the hare and hunting with the hound was abandoned," claims that Pakistan has turned against Islamist militants. But Pakistan's generals have not received the memo, as investigations into the Mumbai attack show that links between at least some elements of the ISI and Lashkar-e-Taiba continue. Pakistan has pursued some Taliban forces in its tribal areas, while leaving others alone to support future Pakistani interests in neighboring Afghanistan. Under such circumstances, America's military aid is at best fueling Pakistan's longstanding rivalry with India, and at worst enabling its enemies. Pakistan's high defense spending has robbed critical social programs of necessary resources. Pakistan continues lag behind comparable countries in general development indicators such as literacy and infant mortality, while its infrastructure is stretched to keep up with the needs of its fast-growing population. Under-funded and corrupt government institutions compound the situation. As Pakistan's civilian and military leaders cynically seek to distract the public from these shortcomings, it is little surprise that Islamist groups often fill the vacuum by providing critical services or that the Pakistani people increasingly fall under their spell. The long-term development shortfalls of Pakistan's government have been exacerbated by a series of disasters including the 2005 Kashmir earthquake, the 2008 economic crisis, and last summer's massive flooding. The latter, which caused nearly $10 billion in damage, has created millions of refugees and devastated an irrigation system that was strained to meet the demands of Pakistan's agricultural sector before the flooding. Today, its failure threatens to cripple a vital sector of the Pakistani economy for years to come. American development aid cannot counter decades of Pakistani neglect, but it can play a productive role in addressing critical needs. Providing Pakistan with more military capability-capability that could contribute to regional instability if it is used on American allies-is unlikely to achieve either. Aaron Mannes and Rennie Silva are researchers and V.S. Subrahmanian is the director at the University of Maryland's Laboratory for Computational Cultural Dynamics (LCCD). BIRMINGHAM, AL—Area feed store manager and local terrorist expert Wendell Butler offered up another one of his brilliant theories Friday outlining exactly what the terrorists should do if they really want to hurt the United States. "I'll tell you what would absolutely demoralize us is if they hit Disneyland," said the 48-year-old high school graduate, whose vast knowledge of how terrorists operate and what the consequences of their potential actions would be is truly unmatched. "With all the families there it would just be devastating. And it's Disneyland, so symbolically that would be like the ultimate desecration of everything American." The razor-sharp Butler then spent the next two hours applying his insightful analysis of global terrorism and its effects to hypothetical attacks on water treatment facilities, hospitals, and the Academy Awards. 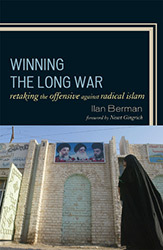 The Journal of Middle East and Africa has just published my review of Ilan Berman's Winning the Long War: Retaking the Offensive Against Radical Islam. Stating that the threat of radical Islam cannot be defeated by force alone is easy, actually spelling out an alternative strategy is more difficult. Ilan Berman, vice president of the American Foreign Policy Council and editor of the Journal of International Security Affairs, has ably addressed this challenge with his Winning the Long War: Retaking the Offensive against Radical Islam. This slender volume briskly describes a wide range of "non-kinetic" means that could be deployed to mitigate the Islamist threat. As a byproduct, it is also a chronicle of the Bush administration's failure to effectively leverage these national assets. Perhaps the greatest weakness of this timely and useful book is its brevity. This brevity makes developing a new national counter-terror strategy seem deceptively simple when there are substantial political and institutional barriers to its implementation. Berman begins by identifying three separate strategic challenges: al-Qaeda and its many affiliates, Iran and its allies, and the undecided Muslim masses. Berman's book is strongest in its proposals for countering Tehran's regional power play (a subject on which Berman has written extensively, most notably in his previous book Tehran Rising: Iran's Challenge to the United States). But he provides a range of policy prescriptions applicable to each of these fronts. No think tank event on terrorism and radical Islam is complete without a call to win the war of ideas—but few analysts provide much guidance on how to achieve this goal. Berman explains that missteps by al-Qaeda and the Iranian regime provide the United States with rhetorical ammunition. With a penchant for spilling Muslim blood and a doctrine offering no solutions to the real problems facing the Muslim world, al-Qaeda's support in the Muslim world has been in decline. In Iran, the government has failed to deliver basic services or economic prosperity. Yet American public diplomacy has been slow to capitalize on these trends or to offer compelling counter-narratives. Iranian history provides ready-made counter-narratives to the Shia radicalism of the Iranian regime. Nor has the United States effectively collaborated with moderate Muslim leaders or the growing number of once radical clerics who have rejected al-Qaeda. American efforts at public diplomacy have also not mastered the media. American established television and radio are also-rans in the dynamic Middle Eastern media environment, and American public diplomacy has been slow to react to events, generally ceding the initiative to al-Qaeda and its allies. Beyond the failure to develop a message or master the medium is a failure to spend money. Berman reports that funding for public diplomacy is still not at Cold War levels. The 2008 budget for public diplomacy was only $1.15 billion, with about $154 million directed to the Middle East. In the context of the United States government, these are tiny expenditures. No matter how good the message is, without adequate funding, the United States cannot hope to make its case to the world's population. Efforts to run an effective public diplomacy campaign face an important organizational hurdle. During the Cold War, the United States Information Agency (USIA) ran public diplomacy. When the Cold War ended, the USIA's functions were folded into the State Department. Public diplomacy and traditional diplomacy are very different missions and at Foggy Bottom the latter is the preferred task. If the United States is to have an effective international information campaign, public diplomacy may have to be moved out of the building. In a chapter on economic levers possessed by the United States, Berman lists a range of options, particularly against Iran, which have not been exercised. With a tottering economy and high unemployment, Iran is extremely vulnerable to economic sanctions—particularly those targeting its dependence on imported gasoline. The United States, the world's largest economy, is well positioned to pressure companies that do business with the Iranian government. Even if the sanctions regime were imperfect, it would increase pressure on Iran's economy and further discredit the Islamic Republic's leaders. Beyond Iran, Berman suggests reforming USAID to systematically use development programs to support American allies and foster pro-American values. Many terrorist organizations provide social services. U.S. aid could help level the playing field and give vulnerable populations an alternative to radical Islam. International law can also be turned to an asset for American counter-terror efforts. Developing a working definition of terrorism rooted in the laws of war that forbid targeting civilians would delegitamate some nonstate armed groups while giving others incentives to modify their tactics. It is easy to castigate the United Nations (UN), particularly in the wake of the massive corruption of the Oil for Food scandal. But replacing the UN is more expensive then reforming it and the UN does have important counter-terror capabilities that can operate in places where the United States is not welcome. As the largest donor to the UN, the United States is well positioned to press the UN to use its capabilities to better support international security needs. Finally, Berman takes on the issue of democratization. As a counter-tactic and as a long-term goal it has much strength. But as a strategy it has limitations both because in many places the fundamental conditions for democracy are not in place so that Islamist movements may prevail at the ballot box and because it can bring the United States into conflict with existing allies and alienate potential ones. In a 2006 speech, then Vice President Cheney criticized Russia's turn from democracy. While Cheney's speech was correct in its content, it only succeeded in perturbing a major power (where the United States had limited options for supporting reform) that could have offered much needed support to U.S. counter-terror efforts. When the United States does promote democratic movements, it needs to maintain its focus to ensure that the movement's gains are consolidated. Finally, although regime change has been discredited due to the Iraq war, it should remain an option for the most dangerous and intransigent regimes such as Iran. Berman reminds readers that foreign intervention is by far the least preferred option; regimes can also fall or (as in the case of Libya) have a change of heart. An enormous question overshadows this most useful book. Berman has done an excellent job outlining a comprehensive, nonmilitary counter-terror strategy. But most of the specific proposals discussed in Winning the Long War have been available to policy-makers since 9/11. What was the barrier to their implementation? In the United States, the president has limited powers of command and primarily has to persuade people (even his own appointees) to support his policies. All of Berman's proposals require the president to take on established interests. Reforming public diplomacy would require pressure on the State Department bureaucracy, while activating effective sanctions would entail standing up to powerful economic interests—both of these challenges pale in comparison to taking on the obstreperous UN mandarinate. All of these things can be done, but at a cost of presidential time and political capital. While presidential appointees will bear much of the burden of implementing new initiatives, without consistent and visible engagement from the top, the established interests in any policy arena will quickly isolate the president's men. Hopefully, Winning the Long War will persuade key policy-makers that, despite the challenges, they must devote the needed attention to implementing initiatives that deploy all aspects of American power—cultural, economic, and political. The long war demands nothing less.